http://en.wikipedia.org/wiki/Alkaff_Bridge for more info about this bridge. That is such a cool bridge! I love it! That is a sensational bridge. it belongs in a playground for the kiddies to play with. 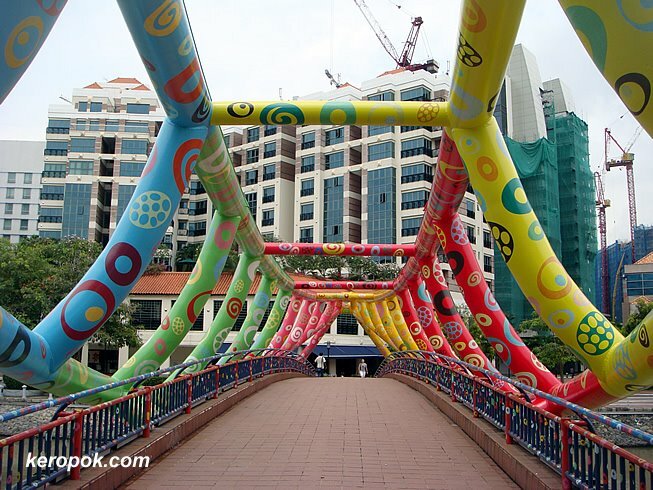 The bridge is beautiful and has a nice and rich history but I dont like the colourful theme, it spoilt the whole look and dont goes well with the surrounding building. Weird. It looks like those big air-cushion which the kids run and jump on at carnivals.